Pollinator gardens are something you have heard about for a while. You want to design one in your own yard but you're not sure where to start. How can you attract more garden wildlife to your yard, including pollinators? How could you design and build your own pollinator garden? Where would you place it in your yard? Which specific pollinators are in your area and how could you attract them? On ep. 20, we help you answer these questions by walking you through how to design and think about the placement of your pollinator garden by incorporating our podcast series: basic garden design steps (ep. 1-6). 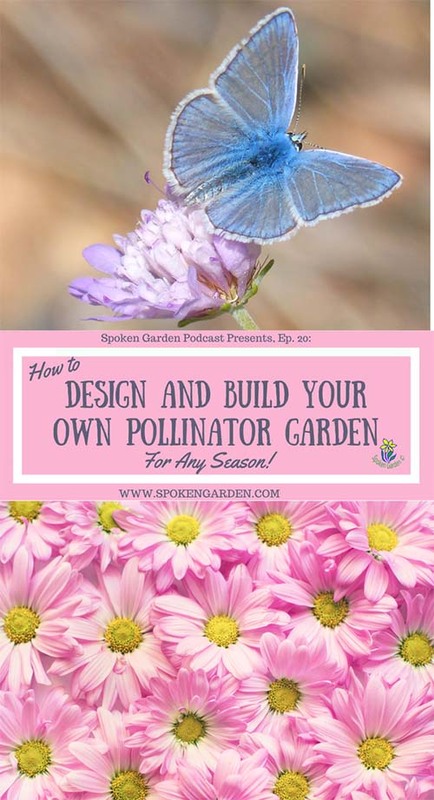 By the end of this episode, you should have a good idea of how to build, start, and maintain your own pollinator garden! This episode is for those of you who need help getting started and understanding the basics about designing a pollinator-friendly environment your own backyard. And, one you can use any season. First, flowers. Without pollinators, many of your favorite flowers, trees, and shrubs would never bloom and blossom. Next, pollinators are crucial to about 80% of the world's crops. Without pollination, many of our food crops would not exist. In addition, a pollinator is important because it signals the sign of a healthy ecosystem. They help clean the air, stabilize soils, and protect the environment from severe weather due to their pollination of the world's plants. Finally, pollinators are crucial because other species depend on them for their existence. A pollinator garden is a garden made up of mostly plants that flower during different seasons and provides nectar and pollen as food to many different insects, birds, and other animals. You need to know what specific flowers a pollinator prefers and what that pollinator also needs for survival. Besides their favorite flowers, they also need access to water, protected habitat for nesting, shelter from weather/predators, and be in a non-pesticide-use zone. This will be different for each pollinator. Any pollinator you want to attract to your garden will need to be within its usual range from its nest. And hey—really quick before you head out—if you want to connect with us and subscribe to our newsletter go to Spoken Garden's free resource page! We have FREE content we are so excited to give to you! See you there! Save "How to Design a Pollinator Garden" directly to your Pinterest page for later! Build Your Own Pollinator Garden! Learn how to design and build a pollinator garden for any season. Coming soon: Pollinator Cheat Sheet! What specific pollinators do you want to attract to your garden, and how? What happens to plants when they are either over or under-watered. Specific examples of plant reactions to over or under watering. Some of the resources below may be affiliate links, meaning we might get paid a commission (at no extra cost to you) if you use that link to make a purchase. Sunset Western Garden - Climate Zones map (for US locations).